NFL introduces new national anthem policy. The NFL responded to recent national anthem protests by instituting a new policy that will fine teams if players show signs of “disrespect” for the anthem. Players will no longer be required to be on the field for the pregame ceremony, but those that are will be required to stand. Additionally, personnel who do not stand can be “appropriately” disciplined by commissioner Roger Goodell. The new strictures were put in place without consultation with the NFLPA, and players are now reportedly devising other methods to protest. Chargers lose Hunter Henry. After suffering a torn ACL last week, Henry will now miss the entirety of the campaign. Henry, who’d been set to enter his third pro season, was expected to take on a larger role after managing 45 receptions and 579 yards a season ago. The Chargers had previously announced they wouldn’t re-sign franchise icon Antonio Gates, but that could possibly change now that Henry is sidelined. Indeed, general manager Tom Telesco said the Bolts will consider all options at tight end and didn’t rule out a Gates pursuit. 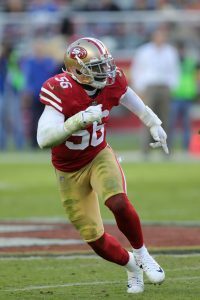 Reuben Foster has charges dismissed. Although prosecutors intended to press on with domestic charges against Foster even though his ex-girlfriend testified she’d concocted her story, a judge put an end to Foster’s case by dismissing the DV charges last week. Additionally, Foster saw the charges in an Alabama marijuana case dismissed, as well, although he is still facing a weapons charge in California. Foster, a first-round pick in 2017, has already been welcomed back to the 49ers’ facilities. Bills cut Richie Incognito. Incognito, who announced his retirement earlier this year, apparently wants to play again, and the Bills have released him from the reserve/retired list. That transaction made Incognito a free agent, meaning the Pro Bowler can now sign with any team of his choosing. Clubs will likely be troubled by Incognito’s most recent incident, however, which involved him getting into an argument at a Florida gym and claiming he is working for the government. Eagles release Mychal Kendricks. After spending much of the last few years on the trade block, Kendricks was finally cut loose by the Eagles. Kendricks, who is only 27 years old, is expected to garner a significant amount of interest on the free agent market, although he is recovering from a minor ankle operation. Philadelphia lost another linebacker last week, as free agent addition Paul Worrilow tore his ACL on Tuesday.